All major brands. Free Telephone Estimate*, 2 Year Guarantee**. 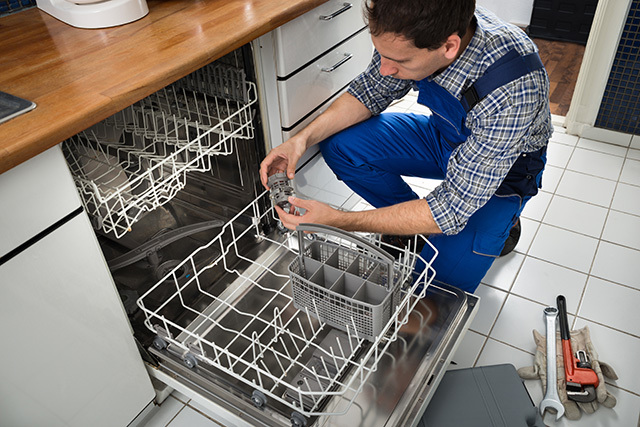 We repair dishwashers across Derbyshire, Nottinghamshire and Staffordshire, in your home. We repair both free-standing and built-in machines. Washercare Ltd. has been repairing dishwashers across Derbyshire, Nottinghamshire and Staffordshire since 1985. We have 1000's of spares waiting to be fitted by our expert engineers. "After calling Washercare, Wayne came the next day. Having been asked the make of our dishwasher when booking, he had parts to hand and after testing the machine, replaced a pump and a clogged pipe. A friendly man, he inspired confidence and gave a reliable service. He came back next day for free to make a further adjustment. I would use him again and highly recommend him." "Arrived on time. Friendly and presentable. Very efficient." "I was given an honest opinion on the state of my dishwasher. Wayne wrote out the problems for me to show my sons which was really helpful."